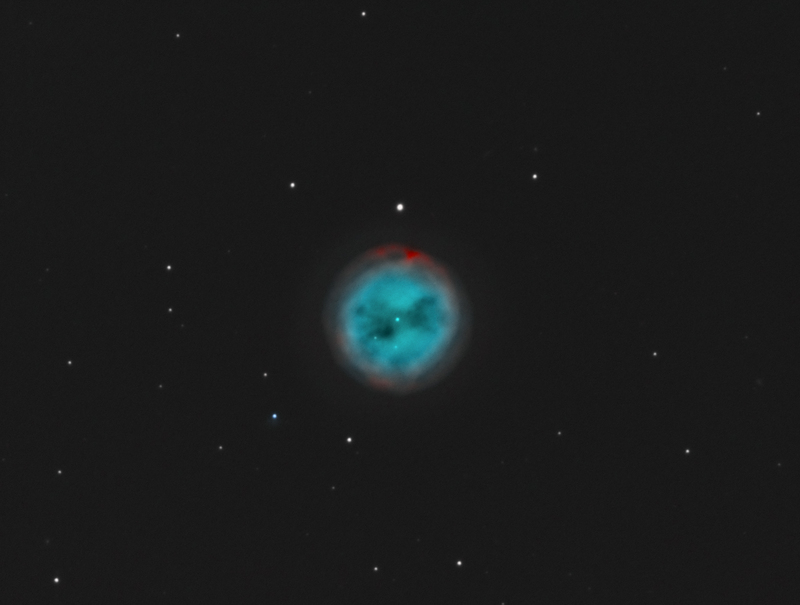 The Owl nebula with the assigned catalogue name M97 is about 6000 years old and therefore an old planetrary nebula. It is located in a distance of about 1600 light-years in the constellation Ursa Major. Due to its age it is quite large and faint, in fact it belongs to the faintest objects in the Messier catalogue at all. It glows in the turquoise spectral line of the excited oxygen but there is hydrogen in the nebula, too. The border of this hydrogen cloud projects beyond the oxygen cloud which is why red glowing structures can be noticed, especially near the northern edge of the nebula. In the centre of the nebula a extremely hot, distinctly blue glowing star is located. The temperature is 85,000 K while its mass is about 0.7 times the mass of our sun, whereas the mass of the whole nebula is estmated to be about 0.15 sun masses only. The hull, repelled by the centre star has a diameter of about 2 light-years and is expanding at a speed of 40km per second.